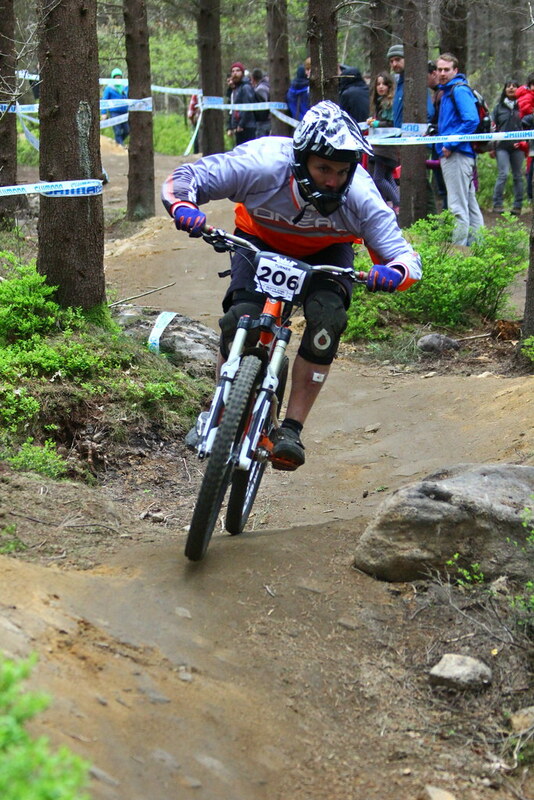 We were at the annual Steel City DH in Greno Woods on 2nd May. It was COMPLETELY ace, as always. Cy was racing and looking spiffing in his new Cotic Oneal Ride Jersey. The organisers had tried to even the playing field by putting in some fresh cut sections the night before the event which mixed up the original red trail with the new black opt in, so it did need some practising. The tracks up at Greno are such good fun, and they were running pretty much perfectly on the day, in the morning. Second runs in the afternoon were slowed down by the rain greasing things up, but it was still bloody good fun. As well as the scores of kids and women and people doing their first ever race, it was - as always - a pleasure to watch top riders on little bikes absolutely flying down the track. Josh Bryceland won by over 3 seconds from local fast lads Swinny "Rocketman" Swinden (aboard his trusty Cotic Rocket) and Hope rider Craig Evans. Josh was just sucking grip out of the ground like nothing we've ever seen. Another level completely. Add to all of that baying hecklers at Jolley's Gap Jump and crowds three deep up the bottom third of the course and the atmosphere is the best thing at a UK race this side of Fort William. If you get the chance, come along next year. It's blinking amazing. They are available in S, M and L sizes and they come up on the big side, so err on the side of going smaller if you're unsure. We have a no quibble swap option anyway, so we can always sort you out if you get it a bit wrong.